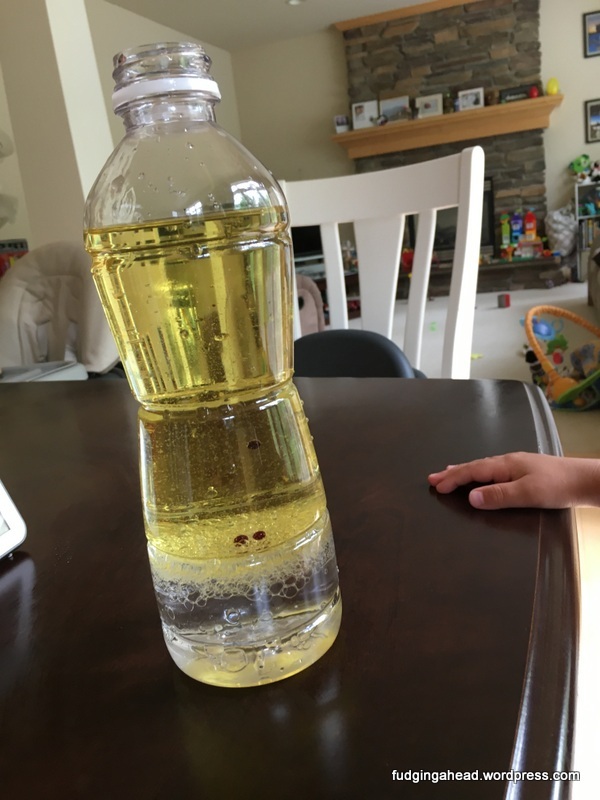 For our newest calming jar, I didn’t take pictures, but all we did was take a small water bottle and 1/2 a bottle of clear glue mixed with hot water to go up near the “shoulders” of the bottle, and then added some food coloring and glitter. All he does it shake it and watch the glitter fall. It’s pretty, he picked the colors and glitter, and it really is calming to watch (I’ve used it myself!). 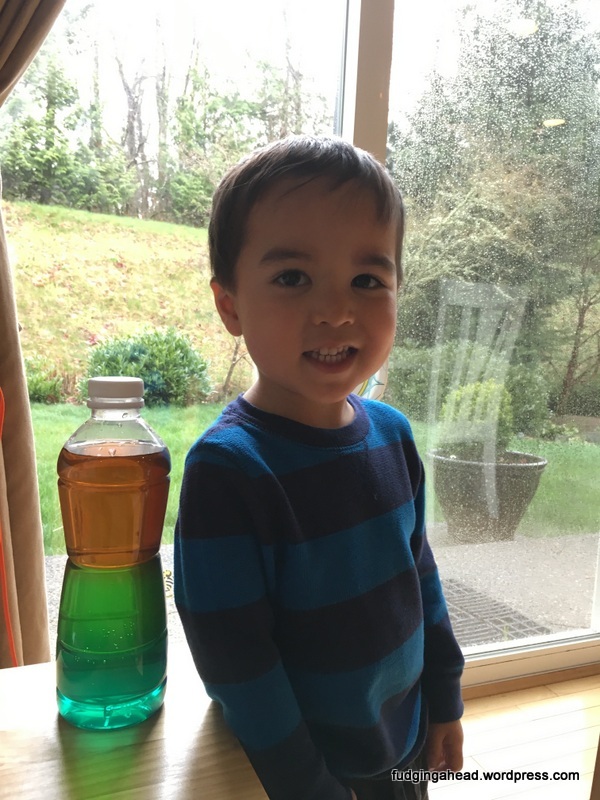 For the bottle you see above, we did colored sugar water with different densities. The greatest densities go on the bottom and then up to the top is the lightest. 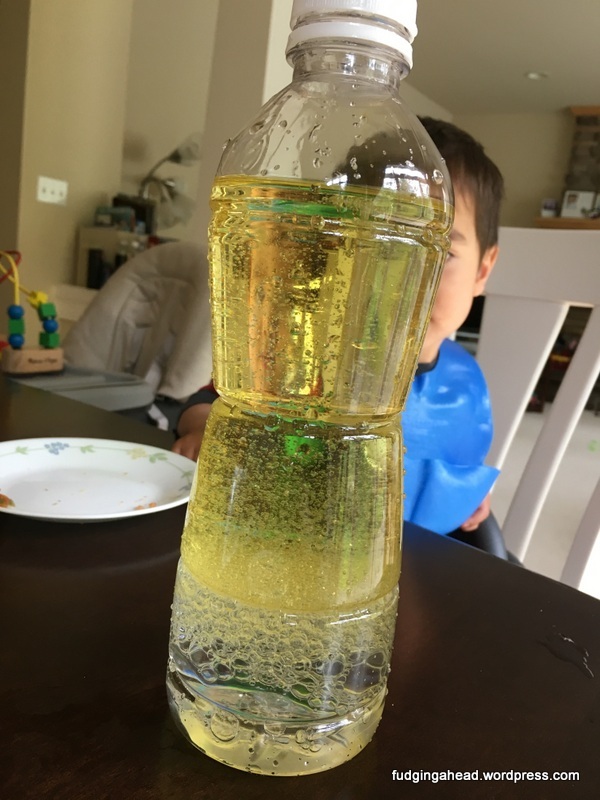 You add different amounts of sugar to the same amounts of water. So, 2 Tablespoons, 4 Tablespoons, etc. for let’s say 8 ounces or so of water. Then for the higher amounts you heat the water because it becomes super saturated. Basically…it’s science, but it looks cool and was another quiet kind of activity. 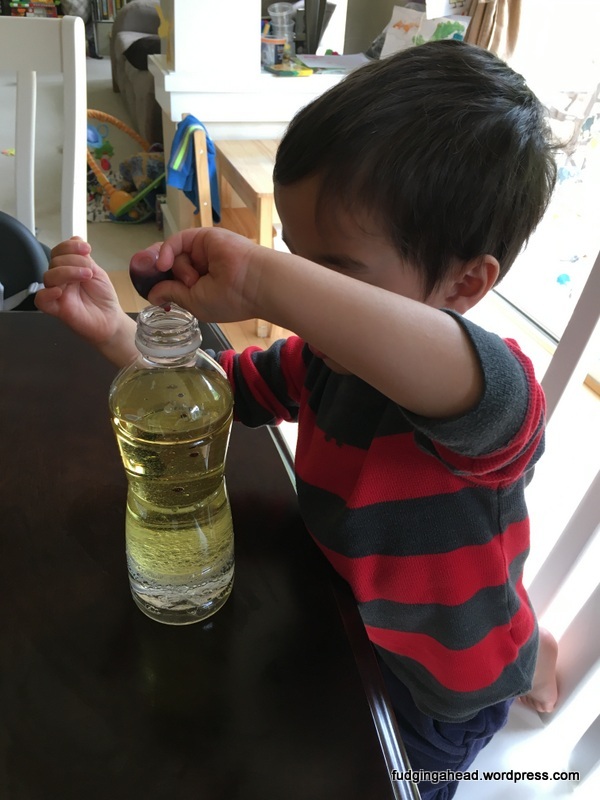 For another jar activity, fill 2/3 of the bottle with regular oil. Then the rest with water. Let them settle, then add some food coloring. 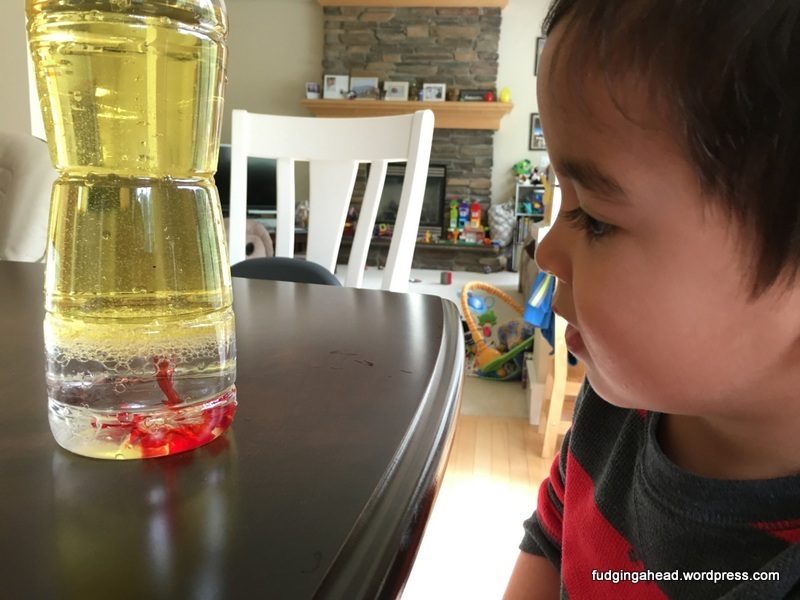 It was really fun watching the food coloring drops sit on the border, then slowly go into the water (which ends up on the bottom). 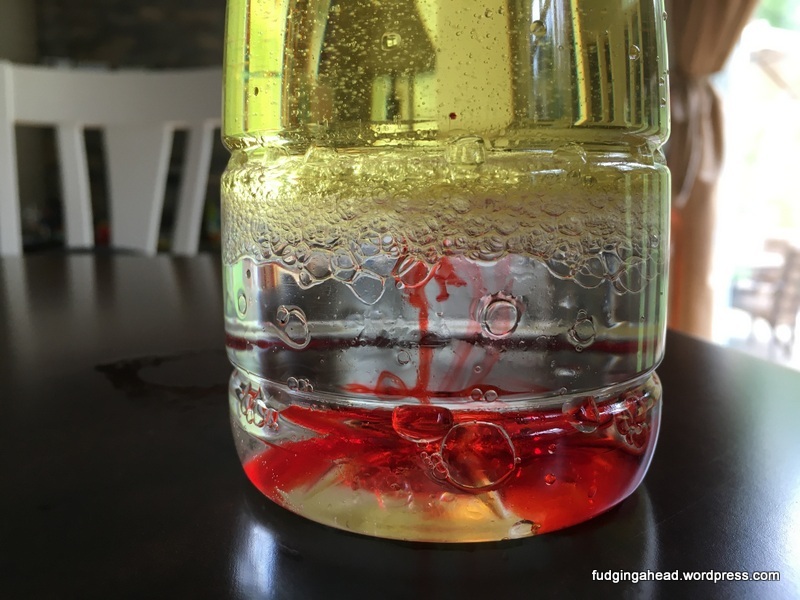 Then, when everything is combined, drop in an antacid tablet (like Alka Seltzer) and watch a lava lamp type of reaction. I didn’t get pictures of the reaction because it’s kind of fast but just try it. 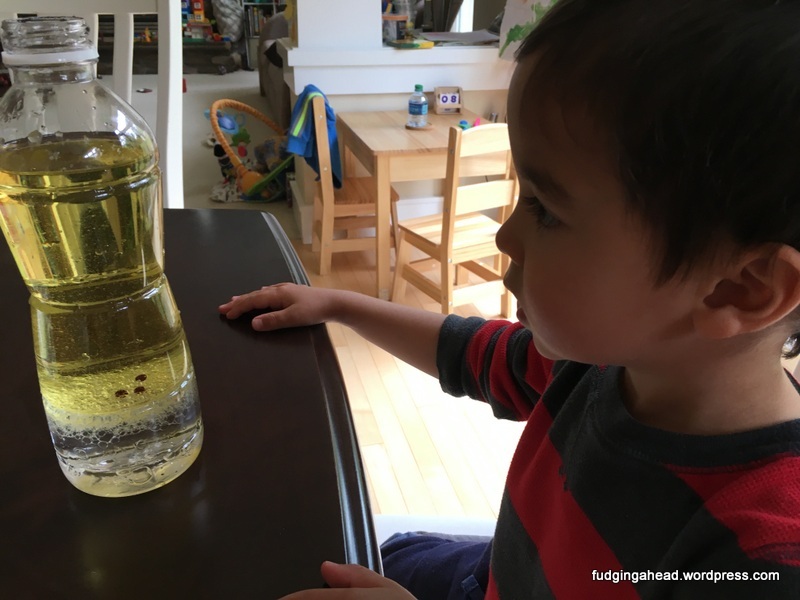 Even without the antacid, this bottle is fun to shake and watch it settle again. 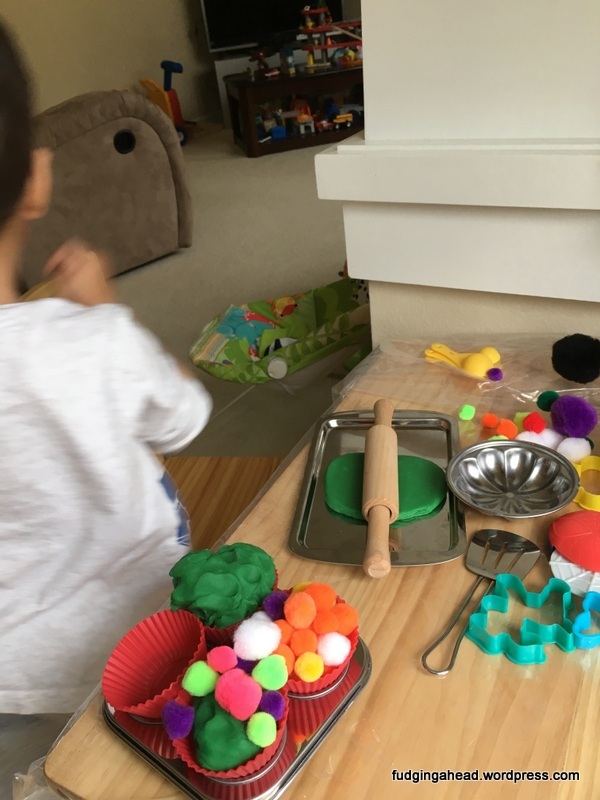 I set up his table with some pom poms and his baking supplies, as well as some play dough. I also gave him some of my silicone cupcake liners to play with. 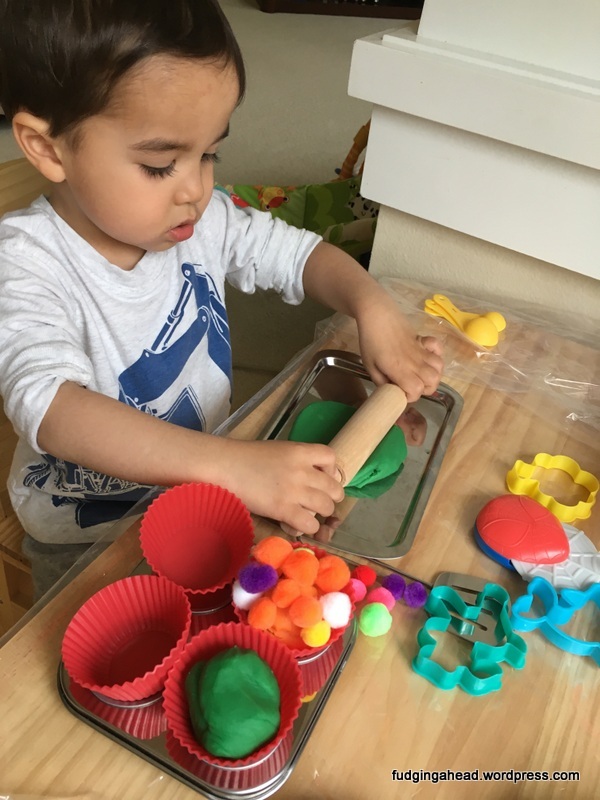 He happily created some cupcakes and had fun playing for awhile. It required a little interaction from me to get him going, but he quietly played mostly on his own. I came across this idea on Instagram for some other pom pom ideas and it seemed silly…but then I figured maybe he would be into it. Sure enough, he was!